MOVE RIGHT IN TO THIS BEAUTIFUL HOME WITH MANY RECENT UPDATES. 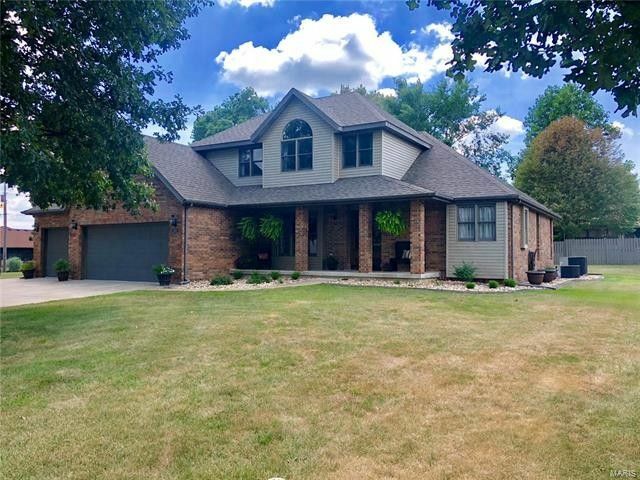 THIS 4 BEDROOM, 2.5 BATHROOM HOME OFFERS A MAIN LEVEL MASTER SUITE W/VAULTED CEILING, DOUBLE VANITY W/GRANITE COUNTERS, WHIRLPOOL TUB, WALK-IN CLOSET, & SHOWER. LARGE FORMAL DINING ROOM, VAULTED LIVING ROOM W/ GAS LOG FIREPLACE. THE UPDATED KITCHEN W/GRANITE COUNTERS & STAINLESS APPLIANCES, CENTER ISALND, BREAKFAST TABLE AREA, BUILT IN HUTCH. 2 HEATING & COOLING SYSTEMS, ONE FOR EACH LEVEL. LARGE LAUNDRY ROOM W/SINK, HANDY 1.2 BATH OFF GARAGE & KITCHEN AREA. LARGE CONCRETE REAR PATIO. THIS HOME IS OFFERED WITH TWO LARGE TREE SHADED LOTS STORAGE SHED, THIS IS A VERY CLEAN & WELL MAINTAINED HOME. PERFECT FOR THE GROWING FAMILY! RECENT UPDATES INCLUDE: GRANITE COUNTERS, SINKS & FAUCETS IN BATHS & KITCHEN, NEW INTERIOR TRIM, DOORS, HARDWOOD FLOORS, CARPET IN BEDROOMS, NEW PAINT, LIGHTING FIXTURES & FANS. 3 CAR GARAGE. 2450 SQ.FT ML LOCATED SOUTH SIDE OF TOWN W/EASY ACCESS TO I-44 HOME CAN BE PURCHASED WITH 2 lots @ $239, 500. Directions: TAKE HWY 5 SOUTH TO MOUNTROSE. LEFT ONTO MOUNTROSE. LEFT ONTO CYPRESS. HOME IS ON THE LEFT. 1831 CYPRESS.